The Philips Moda 245C7QJSB offers a clear IPS panel that’s packaged into an attractive package that features modernized aesthetics. The specs aren’t high-end, but the firm also advertises it to have Ultra Wide Color technology for design and editing suitability. The Philips Moda 245C7QJSB is suitable for various applications including multi-monitor setups, but does it offer imaging qualities that could make it a staple choice? The Philips Moda 245C7QJSB’s aesthetics which focuses on slim characteristics is one of its main highlights. The monitor features a dual-stage bezel that creates a borderless and more attractive look. The bottom bezel with a gray metal finish is the only prominent feature up front which is too distracting from the screen. There is a Philips logo that sticks out from the bottom which glows white when the monitor is in use. This feature casts a gentle glow on your desk so you won’t have to fumble around in the dark. If it’s distracting, you can adjust the intensity or turn it off via the monitor’s OSD. The OSD joystick is one of our favorite monitor features since it makes tweaking easy and quicker. The button is conveniently located at the edge of the bulge, so it isn’t that hard to reach. 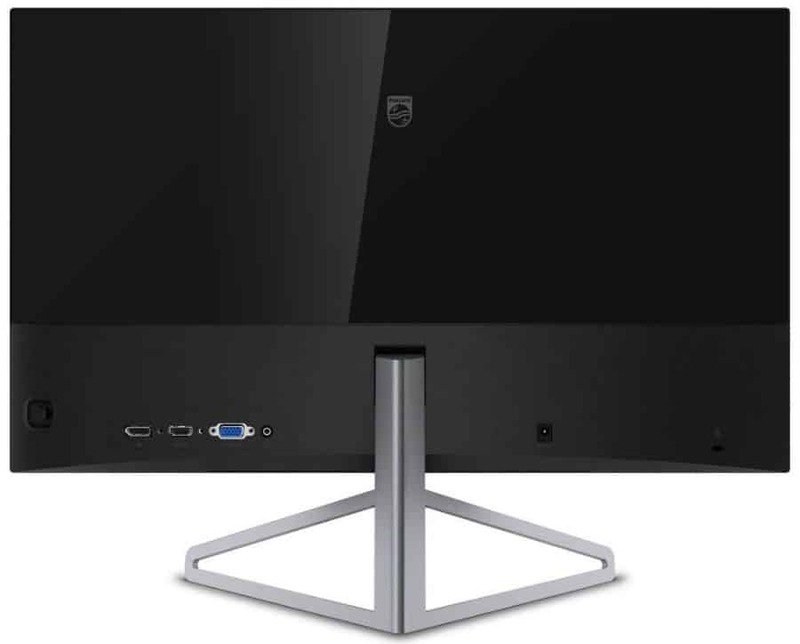 The proportions of the Philips Moda 245C7QJSB are modest when compared to similar sized monitors. Its footprint eats up less than eight inches of depth on a desk while the truss-like design of the base leaves a lot of space in between. The monitor is also one of the lightest we have tested, coming in at less than seven pounds when fully assembled. The screen’s panel is also astonishingly thin at only 5mm, with most of the bulge located at the lower half on the rear. The Philips Moda 245C7QJSB looks like a miniaturized version of LG’s OLED TVs. We love the looks of the Philips Moda 245C7QJSB, but we didn’t like the limitations it presented. The monitor is missing VESA mounting due to physical constrictions, so you have to live with the attractive, but tilt-only stand. The monitor would have been great with a dual or triple VESA mount since it’s so thin and borderless. The Philips Moda 245C7QJSB’s I/O panel isn’t as impressive as those found on other models. The inputs include DisplayPort 1.2, HDMI 1.4, and a VGA connector for legacy connections. The layout is sufficient for a PC and maybe a gaming console, but we always love valuable extras such as USB slots for accessories. Overall, the Philips Moda 245C7QJSB’s build quality is decent for its tier due to the excellent materials and exceptional craftsmanship. The monitor feels a little fragile due to its lightness, but we don’t think it will break that easily unless you drop it to the floor. 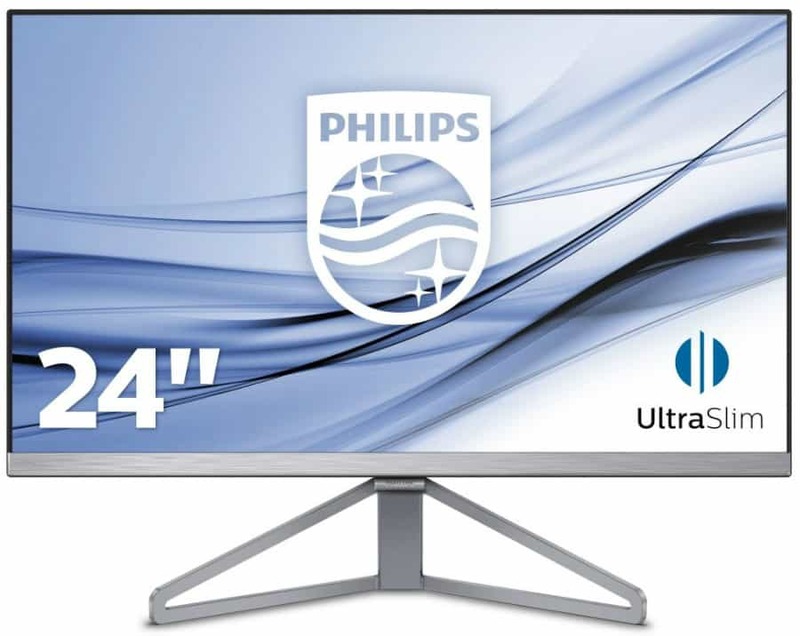 The Philips Moda 245C7QJSB features a 24-inch IPS panel with a 1920 x 1080 resolution, 60Hz refresh rate, and a 5ms response time. The screen is backed by a 250cd/m2 WLED unit and is rated with 1000:1 static contrast ratio which is typical to this category. The specs are not meant for enthusiast gaming or editing, but Philips advertises extensive color coverage as a part of the package. The brand claims wide color coverage for the Philips Moda 245C7QJSB, but testing reveals that the monitor only covers 100% sRGB with some extensions. Accuracy could do better since the DeltaE average of 3.2 is too high for our tastes and there are no presets to provide better fidelity for users. The display looks vibrant, but there are a few shades that look oversaturated when compared to a properly calibrated monitor. Despite the color inaccuracies, the Philips Moda 245C7QJSB still did well in other crucial imaging aspects. The IPS panel’s contrast ratio reaches up to 1100:1 at 50% brightness, pushing past more premium models’ scores. The gamma is close to perfect at 2.23, so shades look balanced instead of watered down or overly saturated. This model isn’t suitable for color-critical work, but its output is great for watching videos or casual gaming. Vibrant titles such as Overwatch appear with eye-popping shades and while color details like Iron Man’s armor in Infinity War are pleasantly detailed and colorized. Another fantastic aspect Philips executed for the Philips Moda 245C7QJSB is the panel uniformity. This characteristic could vary between unit to unit, but at least the review device posted excellent results. Most would expect the monitor to perform poorly in this regard since it is thin, but that clearly isn’t the case here. There are no noticeable dimming on any of the quadrants since brightness variances stayed at less than 14%. Color uniformity also looks good overall, since the farthest from the D65 standard stayed within DE 2.6. The IPS panel did not have any massive light leaks or bleeding, indicating that Philips QC did a great job at handpicking the modules they used. The Philips Moda 245C7QJSB isn’t a gaming monitor, so there are no presets or even FreeSync to help in creating a stunning visual experience. The monitor’s specs aren’t up to the challenge of today’s standards, but at least it’s one of the more responsive options out there. 60Hz isn’t great at motion handling, but at least you only have to deal with 11ms of latency, so there are no delays and “de-synced” instances during use. The Philips Moda 245C7QJSB is a viable option if you are looking for an attractive mixed-use monitor for the home and office. The screen looks more vibrant than most 24-inch IPS screens in the market which makes it great for general use such as videos and casual games. The display’s other imaging qualities also make it an excellent solution for browsing or document processing. There are a few limitations you have to live with if you choose this monitor. The design doesn’t include valuable features such as ergonomics and built-in speakers, plus a limited feature set. However, the Philips Moda 245C7QJSB is one of the most attractive and slimmest monitors in the market pushing it past against various competitors who look bland and boring next to it.